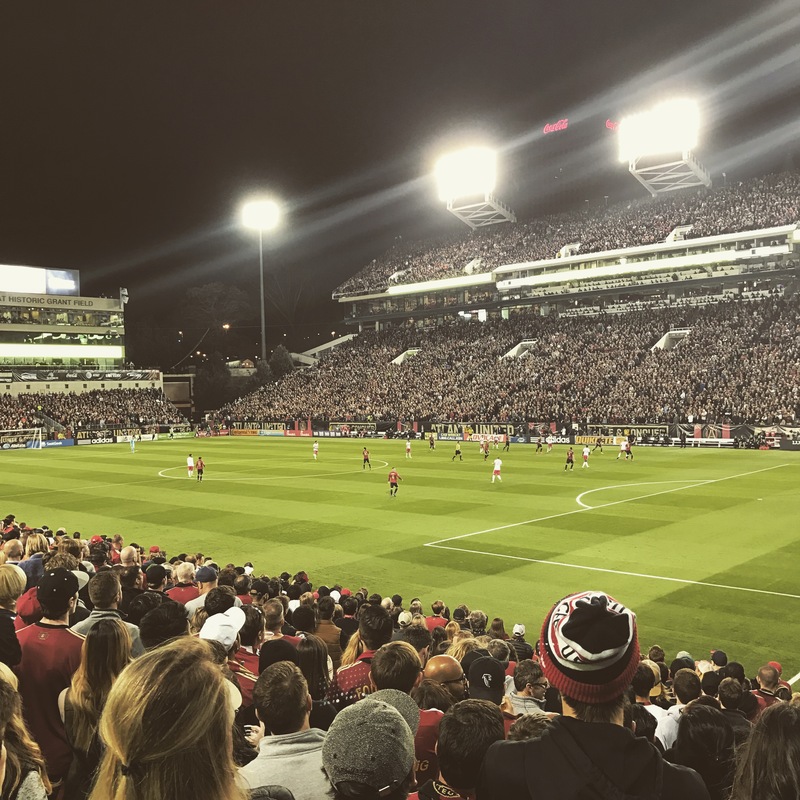 Back in 2014, it was announced that Arthur Blank, one of the founders of Home Depot and longtime owner of the Atlanta Falcons, had been awarded an expansion team in Major League Soccer, North America’s highest level professional soccer league. Blank planned to have the as-of-then unnamed team play its games at the also as-yet-unnamed new stadium he planned to build in downtown Atlanta. At the time, my interest in soccer was largely based on following the World Cup every four years, sometimes paying attention to the Euro championships in the in-between two years and following (albeit not that closely) the English Premier League. Both of my sons had developed into major soccer fans, and I followed largely in order to have some conversation with each of them. Corey became a season ticket holder for the San Jose Earthquakes (I had gone to many Earthquakes games a generation ago growing up in the Bay Area), and Jason developed into such a rapid fan, especially of the U.S. Men’s National Team, that he co-founded a chapter of the American Outlaws (USMNT supporters) based in Knoxville, where he was attending the University of Tennessee. So, when Atlanta was awarded a franchise, I decided to put down a $50 non-refundable deposit for 2 season tickets – with the first game not expected to be played for another 3 full years – in 2017, once the new stadium was built. In the interim, life took on some interesting twists. I got a job offer in late 2014 from a company based back in the Bay Area (where I grew up, and where Corey lives) and FMG & I decided to move to California. We sold our house in Georgia, bought a rather more expensive one in California and never looked back. Except for every single day, from the very moment we moved. The job wasn’t what I expected, and we had just found out that our first grandchild was on the way, back in Georgia. The last thing on my mind was the $50 I had sent to Arthur Blank & company. 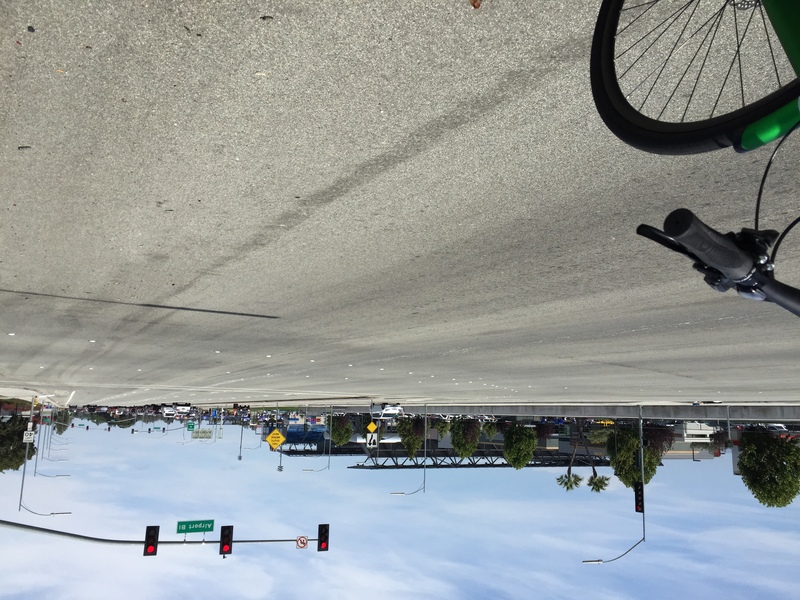 We went to a few Earthquakes games (this was their first season in their brand-new Avaya Stadium, which was so close to where we lived that we were able to ride our “townie” cruiser bikes to games), and had a good time. Ultimately, we decided to unwind the whole California “episode” and move back to Georgia, selling and buying two houses again (2015 was a whirlwind of stress), arriving back at the beginning of 2016, right after I started another new job, where I could again work from wherever made sense. Around that time we found out the new team in Atlanta would be called the Atlanta United, and we were still on the list for “Founding Member” tickets. 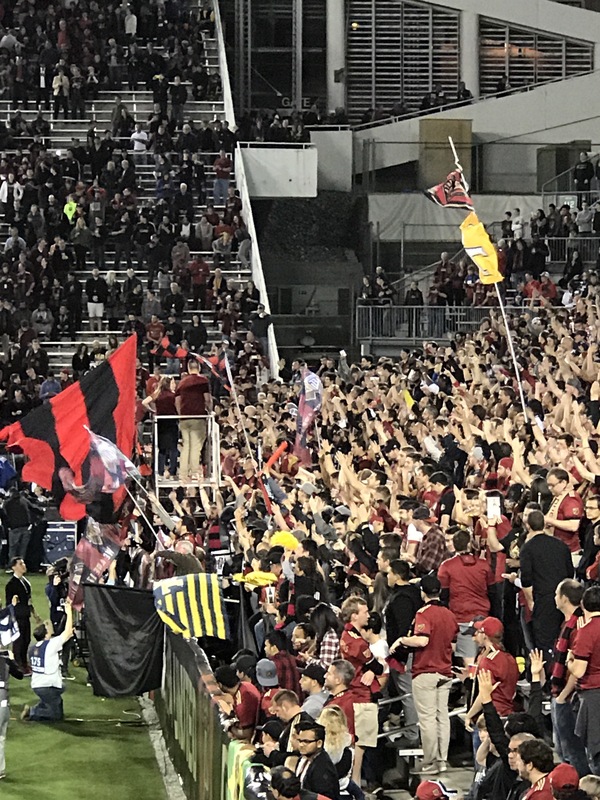 Fast forward to the beginning of 2017, it was announced the team would begin the season March 5, and play its first 6 games at Georgia Tech’s Bobby Dodd Stadium due to construction delays at the state-of-the-art Mercedes Benz Stadium. We got excited about being part of something new. I had previously been a charter season ticket holder for the San Jose Sharks when they joined the National Hockey League in 1991. I kept those tickets until moving to Georgia in 2004. I used to joke that I “bled teal” (despite despising the color), and lived & died with every Sharks game as a result of being there from the beginning, from the first home game. That, despite the tribulations of being one of the best teams in hockey for 10 years, but underachieving, until finally making it to the Stanley Cup Finals two years ago…and promptly losing in 5 games. The idea that somehow this new Atlanta soccer team would become that much a part of my life seemed unrealistic. I tempered my expectations greatly because soccer is “new” to the South, because Atlanta has a notoriously bad history of not supporting professional sports teams in general, and because I thought it was a mistake to put the team in a 70,000 seat multi-purpose stadium, when the trend in MLS has been to do the opposite – building soccer-specific venues with 18,000-22,000 seats, and that trend has made the league succeed in ways no one thought it could. So, on March 5, 2017 wearing new Atlanta United shirts and hats, FMG and I went with high excitement & low expectations to Bobby Dodd for the first ever game. It was a sellout (as you’d expect for a “first”). We took MARTA, ate hot dogs at The Varsity pregame, and wandered over to the stadium. We really didn’t even know who the players were. At the time, I thought Atlanta United had made another mistake by not bringing in a big-name player from somewhere else, like many new MLS teams have done. In retrospect, that decision was brilliant. United had brought in a big-name coach – Gerardo (Tata) Martino, an Argentinian who had coached their national team as well as Barcelona (including, in both cases a guy named Lionel Messi). I’d read a little about a guy nicknamed Tito (Hector Villalba), that the coach brought from Argentina, and I knew that they had signed U.S. backup goalkeeper Brad Guzan from the EPL but that he wasn’t arriving until his English season ended, in July. It’s easy to reflect now, but what started that night in March became overwhelming. We fell in love with the team on the pitch, with amazing, young, previously unknown (at least to us) players like Miguel Almiron, Josef Martinez and Yamil Assad, and older veterans I’d heard of but didn’t “know”. 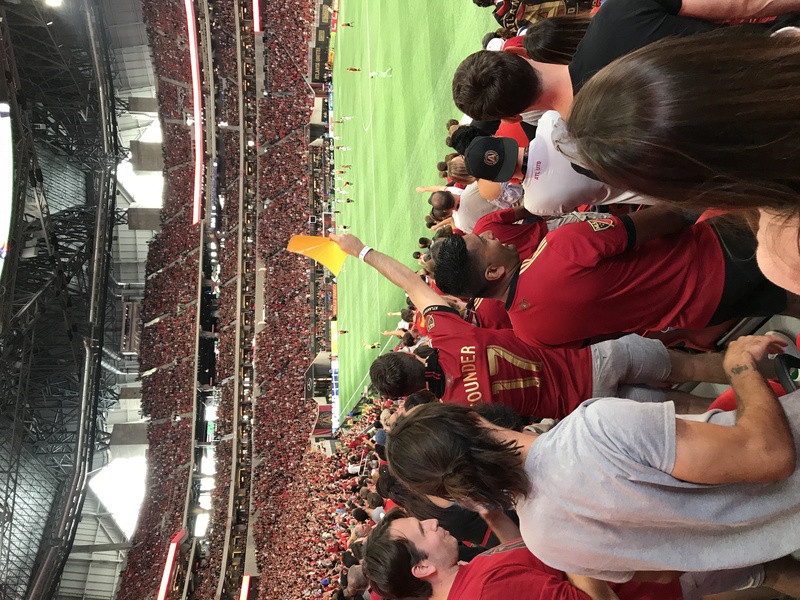 The atmosphere at Bobby Dodd started off at an 11 (on the 10-point scale) with raucous crowds and supporters, and because of a combination of enthusiastic fans & very uncomfortable aluminum bleacher seats, everybody chose to stand. 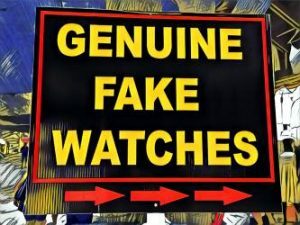 For the entire game. An organic development that continued for every game. 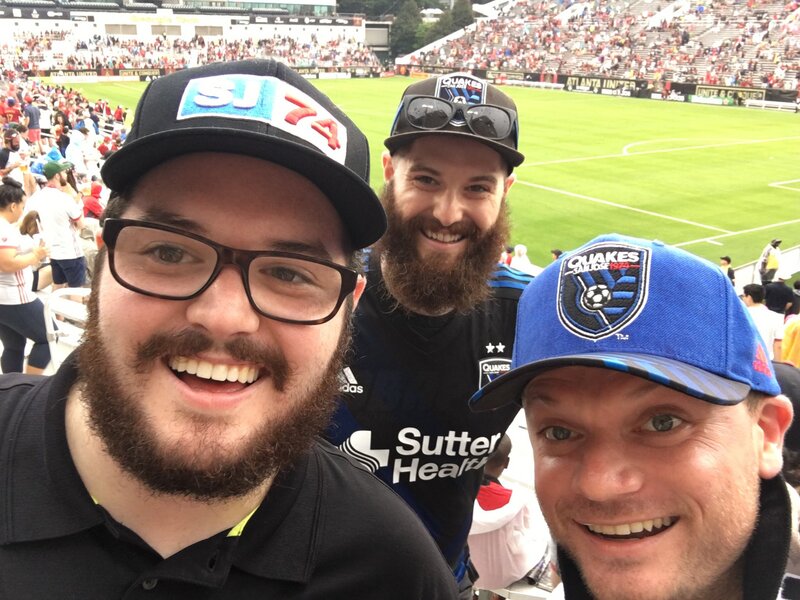 Jason, Corey and their friend Matt Cucuzza came to Atlanta for the July 4 game against their team – the San Jose Earthquakes. if it wasn’t for them, I probably wouldn’t even like soccer. Photo Credit: Geoff Galat, July 2017. We fell in love with the game day experience, even when the temperature in Bobby Dodd in June & July approached that of the surface of the sun, only humid. Even when the crowd excitedly anticipated when a small sliver of cloud might block the setting sun, protecting us momentarily from the reflective dense heat of the all-metal innards of the old stadium. To the point that when it was announced that we’d finally move to our sparkling new stadium with the roof, air conditioners, plush seats, fancy restaurants & bars and better sight lines, we actually worried that we’d lose the “home pitch” excitement that had organically happened at Bobby Dodd. I remember thinking the same thing in 1993 when the Sharks moved from the dumpy, nearly 100-year-old Cow Palace in San Francisco to their new arena in San Jose. In both cases, the passion moved with the team. After moving to the new stadium, the same experience continued, but with better concessions and more restrooms, and with every game selling out, sometimes at ~44,000 seats (with the upper deck curtained off), and a couple of times with it open to allow more than 70,000. 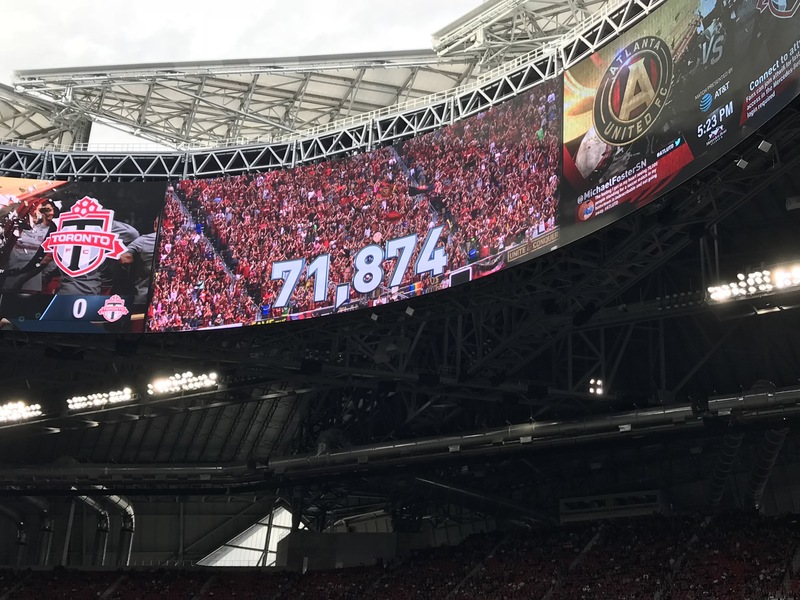 United even set multiple MLS season-long and single game attendance records. In Atlanta. For soccer. Every last one of them standing. I’m sure there are some some who don’t like (or want) to stand for an entire soccer match, but for me, this organically grown tradition is irreplaceable. The United has manufactured some traditions (like the game opening Golden Spike, etc) that are fun, but this “happened”. On its own. I know the team’s “fan experience” leadership has struggled with the idea of the crowd standing all game, because nearly every week when I got the post-game fan survey, they asked very specifically about my thoughts on standing. As you could guess, I wouldn’t want it any other way. By the way, this team has done a great job “off the pitch”, with surveys, social media presence, offseason activities, and even establishing local bars and pubs as away-game viewing locations (in fact we watched nearly every away game at Pizzeria Azzurri, just a few blocks from home). We had so much fun in 2017 that we not only renewed our season tickets, but we bought two more for this upcoming season. So, in a year when so much of the world seemed so divided, soccer, of all things, brought together Atlanta. United, We Stood.